BOUCHERIE is a traditional FRENCH brasserie and steakhouse, celebrating Joie de Vivre in the heart of West Village. 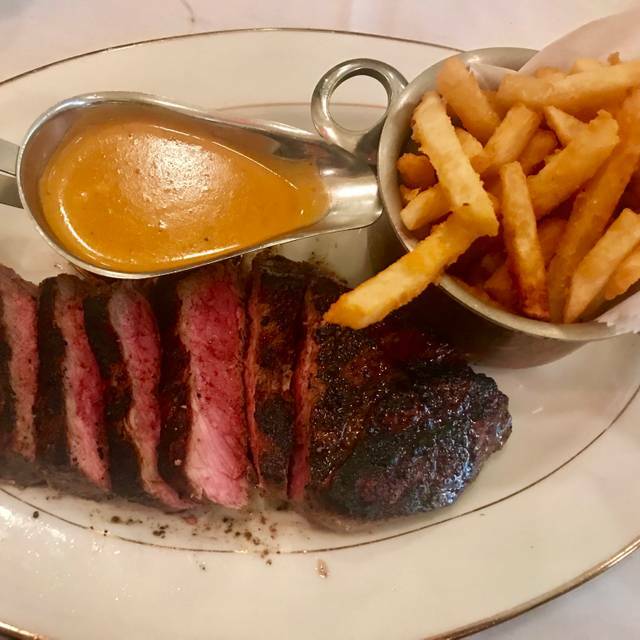 Executive Chef Jerome DIHUI, former Chef de Cuisine of Pastis, prepares a menu of French classics and timeless bistro favorites, in addition to the DRY-AGED STEAKS. In addition to an extensive wine list and classic drinks, Anthony Bohlinger (formerly of Maison Premiere) developed a beverage program that boasts an inspired menu of absinthe-driven signature cocktails. Surrounded by walls of majestic wooden-framed mirrors and original Belle Époque posters, seating at our GRAMERCY PARK location varies among pristine white marble and wood bistro tables, cozy burgundy leather booths, a 32ft. handmade pewter bar, and an option for a 40-guest private room, to make the 222-seat restaurant feel timeless and intimate with vibrant, contemporary joi de vivre. Reservations for an early Easter Sunday brunch and the restaurant was lively but not full yet (which was great for us since we had a baby with us). Food and drinks were great, service was attentive and patient; highly recommend! I went with two teenage boys and I thought it was a little pricey for a neighborhood place.. I am fine with the 25.00 hamburger.. But least expensive steak was 47.00 - Refills on the soda were $ -They could at least comp a soda when they see you have kids..
Food was quite good, service was decent, tables for two way too small and feeling of crampness. And the leather banquet seating seemed to come from a bus terminal. Enjoyed our meal but wouldn't come back. Boucherie is a solid french bistro in a convenient location. I do think their brunch menu on the weekend is limited and a bit overpriced. All the food was terrible. The French onion soup was burnt. The Octopus was poorly prepared and cooked as it retained too much fat upon serving. The duck confit was over cooked and dry. We didn’t even drink booze but ordered 2 bottle of sparkling water and the bill was almost $160 with tip. Zero value and zero satisfaction. Service really bad. Steak tasted like it was 2 days old. Ambience cool but noisy. Probably not worth going to this restaurant. It’s ok. But like 2 times more than it should be. I’ve been to a hundred better restaurants in the city for cheaper. $38 for a bolognese pasta? The ambiance is lovely, just like a French bistro. Our party of four all thought the food was outstanding and beautifully presented as well. Lovely space, solid bistro food, energy level great which makes it a bit noisy. The service and speed were terrible. I had called earlier int he day to ask to put my card on the bill (I was with my partners family and wanted to be sure I picked up the bill). During the meal I even gave my card to the waitress (when I used the restroom) and was clear this was for payment at the end of the meal. When the check came, she ended up taking the card of my partner and returning mine. Absurd. The food was decent but somewhat cold, so was the latte(s) - not hot at all, we sent 1 back ...it never was returned. I'd say we sat with a 7 year old and a 3 year old for 40 minutes with no food (we ordered croissants to be served asap for them, how long should that take to bring out?) . Thankfully they are well behaved, but this situation could problematic for many children. This place is a mess overall, will not be back and will discourage others from wasting their time. There are a bunch of other restaurants in Union Square, go to any of those. Lastly, I have been to the location in the West Village, heads above this one. Having just returned from Paris we were looking forward to the bistro style restaurant Boucherie represents. Unfortunately we were disappointed. The ambiance is outstanding and service is professional but food is overpriced and lacking. Duck confit was totally bland and flavorless and the beef Bourgogne was tough and dry. Our overall experience was good. The appetizers were out of this world. We had steamed oysters, fau gra, and escargot. All were served with fresh baguettes pieces. Dunking the bread in the garlicky butter was the best. The main dishes of frog legs, citrus salad and grilled octopus were average. Really nothing to write home about. The wait staff was attentive but average. If you are in the mood for french food try the restaurant. If you are looking for 5 star French food, go elsewhere. I had an amazing night with my friend. Food and service were excellent. If you want to try outstanding stakes, this is the place to go. A visit to this restaurant was a planned splurge during our trip to New York City. It did not disappoint us! Our waiter was very attentive and helpful. The food was amazing. The noise level was high, but we enjoyed that and it just added to the experience. Second dining experience in one month; not dissappointed at all. Consistent yet unique. First time here. I really liked a lot. But WHY DO HOSTS seating people always put you next to a crowded table when there are so many empty tables around. My reservation note stated “quite table and not to be on top of other tables/people. Had to move or I asked before being seating if I could go to the next empty table - there were many around. I would say 75%. So besides not acknowledging my reservation note; I just wish common sense would be used when there are so many empty tables. 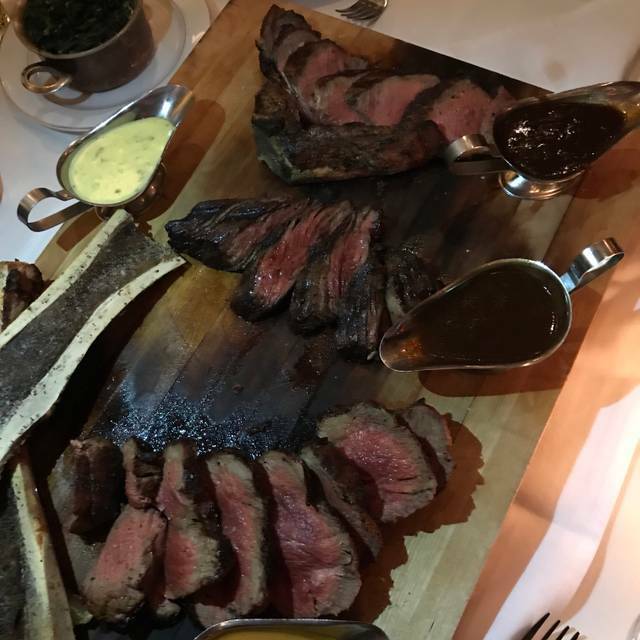 The three of us (including my very hungry 23 year old son) had a Tomahawk for two , creamed spinach, salad and onion soups. The food was great and the Tomahawk was perfect for the three of us. We would definitely go back. We really enjoyed our dinner. Shared beet salad, roast chicken, loop de mar, and ravioli with a shared creme brûlée. All were delicious! It was a little loud and service was good but had a little room for improvement. Great large open space. Nice bar seating. Excellent wine list. Good French staples. Good atmosphere, and the staff is really friendly, but the dishes are hit or miss, so I would say do your research before ordering. Loud rock music in a French Bistro? I couldn’t hear my dinner companion unless he spoke over the noise. Service was slow and the waiters were distracted. They were socializing with each other more than serving. The food was “okay” but not worth the price. Skip this place. I had a work dinner here the other evening & was excited to finally try here! Sadly I left with mixed feelings. The food was good, especially dessert, but everything else was so-so. Our server was nice but sort of indifferent. The decor is like a cute brasserie. Next time I think I’ll stick with Balthazar. Service was slow, which is strange because it was not packed. But it has a nice atmosphere, kind of like a huge Balthazar without the crowd. Food was great! wine by the glass seemed very pricey. Food quality very good. Tradition French bistro atmosphere. Felt fun to be there. Food is mediocre. Prices are high. What's to like? The food was very good - the servings American style = BIG. Everything was as really good. Maybe our server was really busy? Basically dropped off the food and came back when we were finished. Maybe it’s a New York thing, but I thought he would pop by to ask how things were once we had a few bites? I would go back when we visit New York again. They asked me to submit a positive review in TripAdvisor in exchange of a dessert. Very cheap. Had a very enjoyable lunch. 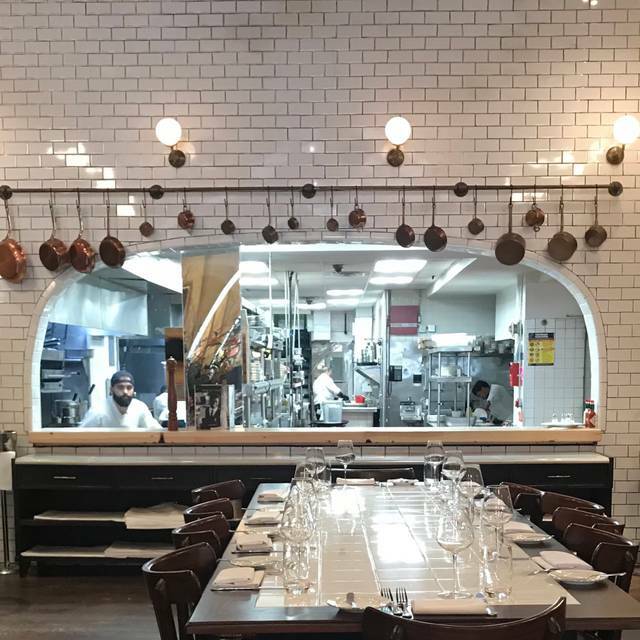 Boucherie has become one of our absolute favorite restaurants in NYC! Our table, the service, wine selection, and food was the BEST NYC has to offer! The attention to detail, outstanding service, and knowledge by our Sommelier was most impressive! We will return to this incredible establishment during our next trip! Terrific meal and friendly service! Authentic French! Scallops were excellent. Great value and service. Outstanding. Food excellent. Service cannot be faulted. Marts superb at looking after you. Good experience. Not great. Food is good, service very good. The place is a bit noisy but that’s the expectation for a brasserie. Also I felt that the place is a bit overpriced for what it is.